It´s not going to be easy to write tonight. I just discovered that I lost my flashcard with all my travel photos on it. I erased my camera memory card already because I´m stupid. There were some fab shots on there so I´m going to have to start writing extra special stuff to make up for the lack of visual aids. I had already put on a couple of photos and the rest I pilfered from the blog of my friend, Sara from Seattle, http://www.saraguatemala.blogspot.com/, who I´ve been traveling with this week. After 4 weeks of spanish classes, I was ready to see more of Guatemala. This crater lake, formed 85 thousand years ago, is surrounded by three volcanoes and a few small villages, some only accessible via lancha (12-seater boats). I started out in San Pedro, famous for cheap language schools, hippies, and buddhas meditating by the lake, however the $5 room also came with a strong odour of manure which was drying across the street and a continuously-barking dog. Without much contemplating I changed direction and went to another village on the lake. Jaibalito was super fabuloso. The photo shows how it`s built into the side of the mountain. Lots of stairs to climb, although I didn`t complain when I saw how they have women labourors hiking up and down the 100 or so stairs, with bags of sand for a solar-energy system they`re putting in, all day long. I guess the men are `skilled workers` so the important jobs are saved for them. Despite the other tourists, all American couples... some of which were quite loud & obnoxious, I was able to get some quality time reading in hammocks, kayaking, and swimming. It really was a piece of heaven with great food. It reminded me a bit of the Shushwaps in British Columbia, but without the loud boats and jet skis. You should see my photo of the humming bird.... ay yai yai. After a few days in paradise... one can really lose track of time there... I went to Antigua, the once capital city of Guatemala until it was flattened by an earthquake. Anitgua, which actually means old, couldn´t be more different than the rest of the Guatemala I´ve seen so far. It´s got a European feel, with cobble-stoned streets, old churches, ruins to wander in, colonial buildings, restaurants and tiendas (stores or shops) that actually have permits displayed and didn´t seem like you were in someone´s house, and not once did I see a stray dog. It´s also more expensive, but still affordable for a rica Canadian. Most restaurants and hotels/hostels open up to beautiful court yards and gardens inside. I stayed in an old convent because I liked the idea of living where the nuns live. I bet they didn´t have to deal with a noisy disco next door though. This arch was built for them so they could cross the street without being seen. I would have loved that part, particularly before my morning coffee. Antigua hosts a lot of tourists and there are Spanish schools all around, surrounding a well-used central parque. All in all a cool place to hang out and eat well. Near Antigua I went on a guided-hike up to Volcano Pacaya, looking ravishing while sweating to death. Pacaya`s been erupting slowly for the past two years. At the top, the heat coming from below my feet was hard to bear. One stupid girl, more stupid than me, wore plastic `crocs` which subsequently melted. A smarter French-Canadian guy brought angelitos (marshmellows) to roast. On the descent, one over-zealous tourist (need I say the nationality?) got a bit close to some huge rocks and they came falling down on him. I met Sara from Seattle in Guatemala City. We took a first-class bus, which would put Greyhound to shame, to Livingston on the Carribean coast where it meets the Rio Dulce, in the hopes of ´getting our Garfuna on´. We managed to find a nice hotel with the best banana pancakes in the world. I had them three days in a row. Unfortunately, that was the upside to Livingston. I had anticipated African drums and happy, colourful people smiling and dancing all around. In truth, the people were indifferent except for the agressive ones trying to sell us lanchas or their handi-crafts. The only real activity we could find was a 5 km beach walk to Seven Altars Waterfalls. Not sure I´ve ever seen a beach this dirty, with pampers washing ashore, pigs and chickens roaming about, and the locals going on about their business and ignoring the gringas despite our warm ´Buenas Dias´ greetings. Possibly they only speak Garifuna? And, damn, it was hot! The waterfalls at the end weren´t actually falling due to it being the dry season, but there was a nice refreshing pool to cool off in. On the way back we stopped at the only nice part of the beach with a hotel and restaurant where and had the best margarita of my life. I like the palapas... most contain hammocks. Me gusta hammocks. Livingston wasn´t all that bad. Had a couple of good meals, including Tapada, made with shrimp, white fish, plaintains, coconut milk, and other spices that make it delicious. I didn`t like that they kept the fish heads on though. Also enjoyed cena (dinner) at a backpackers place next door where we met some cool, worldly people. I had a French/Spanish/English all mixed up conversation with a couple from the South of France after a few beer. They now think I`m stupid, too. The owner had just been electrocuted so there was also the excitement of his hospital(s) experience. I don´t recommend needing medical attention in Guatemala. Good news as I last heard he´s on the mend. 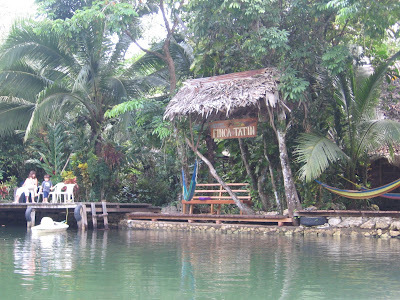 Thirty minutes from Livingston via lancha we went to a hostel in a real jungle, Finca Tatin, along the Rio Dulce. Nice atmosphere with a big common room to play games or lay around in hammocks. I`m in love with the swing chairs. The best part was the family-style cena where we were served a family-style, delicious meal. It´s a great way to meet the other guests. The accomodations were quite rustic... we had to patrol for spiders and other enormous insects, which I`ve never seen the likes of, in our bungalow prior to using the bathroom or going to bed. A girl the day we arrived got stung by a scorpion. Someone took a picture and it had baby scorpions on it`s back. My nephews would LOVE it there. We went on a night walk to a cave where I somehow managed to find myself at the end of the line on the way back, turning around I couldn`t see a thing but I FELT eyes upon me. Not scared at all. I actually surprised myself by not being too freaked out by all the bugs, but, seriously, did you know cockroaches could fly? One was so big and flying around that some of us (not only me) actually thought it was a humming bird. 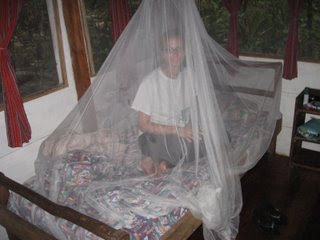 Sara, not quite as brave as me, made me tuck her net in when she went to bed. It sucked when we had to get up to go pee. A day of kayaking with some guys staying Fincan Tatin took us on a beautiful nature journey to a Biotopo reserve which has several lagunitas in which to float around the mangrove forest. I was trying to spot a crocodile or an endangered manatee, which a woman we met said were plentiful in the area, but no luck. Fishing is the pretty much the only source of income for the 19 families of the Centro Cultural Mayan Qèqchi community where we stopped for lunch, which by the way only served cerveza and agua. There are also eco-tourism programs going on as well. They have a church and a one-room school for 50 children. 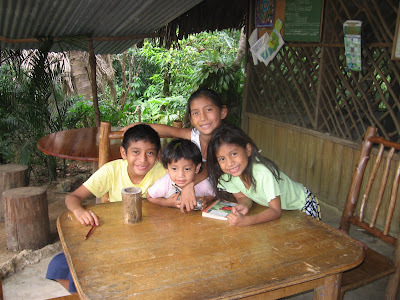 We spoke to these niños and their mom who was working at the restaurant. They learned Spanish in school and were quite happy to share as much as our bad spanish could comprehend, while showing off a book they had. They love school and go every day except for Sunday when they go to church. There are several like communities in the area. Most were displaced in the 40`s and 50's when they were forced to move there by the government. It`s no wonder they are struggling so much, but it`s nice to see the efforts of all the NGO`s helping them self-sustain with arts and crafts, agriculture, and even paper made from banana leaves or corn husks. The many varieties of birds, frogs, and plants, particularly all the water lilies, made for an interesting and serene trip. I love immersing myself in nature this way, although the peace wore off a bit on the way home since we ended up going against the current and wind. Seven hours hours and badly burnt knees later we made it back, stopping for a dip in the natural hot springs along the way. My arms felt like they were going to fall off. A sauna and river swim helped with the pain and I appreciated the hammocks all the next day even more. GOOD NEWS! A guy just came by and gave me my flashdrive which must have dropped out of my bag earlier. Phew! Something I couldn`t get enough of was watching the locals go by on their cayukos, skinny wooden boats. They make rowing look so easy and how can the edge be so close to the water? Sometimes they`re fishing or it`s a mom with her kids, and some are commuting to school or work. I could just sit in a swing chair and watch all day long. In fact, I did. These chicos in their cayuko encouraged me to take a photo then gave me the finger, laughing hysterically as they floated by. Boys will be boys! Volcanoes, lagoons, and Rio Dulce national park... Ilsa recommends.